Whether you remember Wally from his playing days in the big leagues or you're just learning about his stellar career, get better acquainted with Wally Moon and stay connected with his life and recollections by becoming a charter member of the Wally Moon Fan Club. During his playing days, Wally Moon was known, not only as a terrific hitter, but also as fan favorite for his gentlemanly and gracious demeanor. Encounters with Wally, whether personal or via his exploits on the field, have left a mark on countless lives. Here's a sample of the fan mail Wally has recently received via his Web site. Check out an archive of media coverage about Wally Moon's career. Growing up in Los Angeles, Linda Lindquist was a diehard Wally Moon fan, but she never got to meet her favorite Dodger until he surprised her with a visit to the Texas Medical Center. Visit the MD Anderson Cancer Center blog to learn more about this very special occasion. 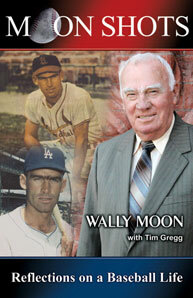 Was Wally Moon's St. Louis book tour the catalyst to the Cardinals' shocking run to the 2011 World Series championship? Or was it the Rally Squirrel? No doubt both played a factor in the Redbirds winning their 11th World Series title in 2011. Check out the photos from Wally's St. Louis trip. A&M Baseball Celebrates "Wally Moon Day"
The nationally-ranked Texas A&M baseball team honored one of it's greatest alums Saturday, April 23, with "Wally Moon Day." A capacity Olsen Field crowd greeted Wally warmly, saw him throw out the first pitch and watched as the Aggies posted a 5-1 win over Oklahoma State. Houston's Redstone Country Club, home of the PGA TOUR's Shell Houston Open, also hosts the annual Major League Baseball Players Alumni Association's benefit golf tournament. Wally Moon was on hand and in the best-ball format unofficially shot his age with a projected score of 81. The St. Louis Cardinals' annual Winter Warm-Up fan festival is a three-day love-fest for all things relating to the Redbirds. Wally was on hand at the event, promoting the upcoming release of his new book and making plenty of new friends among fans both old and young. On February 27 baseball lost one of it's truly great players and fine gentlemen and I lost an outstanding teammate, a dear friend, and an accomplished bridge playing partner. Edwin "Duke" Snider was one of the premier baseball players of the 50's and 60's. A ballplayer's appearance at the Bob Feller Museum in Feller's home town of Van Meter, Iowa, might be the next best thing to induction into the Baseball Hall of Fame. Wally Moon recently made his appearance, signing autographs for fans. There's a fun and easy way to become a member of the Wally Moon Fan Club and to stay up to date with what's happening in Wally's life: become a member of the Wally Moon Fan Club on Facebook. You'll see exclusive video and photo content, the latest news and be able to interact with other fans. Wally is pleased to announce his new YouTube channel, "WallyMoonFanClub". Here you'll find some of your old favorite Wally Moon video clips, plus new clips featuring other members of his family reminiscing about some of their favorite memories of Wally, both as a big leaguer and afterward. Become a Subscriber or Friend and leave your comments. And tell your friends about "Wally Moon TV"! Check out Wally's personal photo gallery from his recent trip to Los Angeles to help commemorate the Dodgers' 1959 World Series championship. Wally was the catalyst to that team's success, finishing fourth in that year's Most Valuable Player voting. See Wally with his ex-teammates and relive the glory. You've let us know your thoughts. We've listened. And, the Moon Shop is now open. Our on-line memorabilia store is the ONLY place you'll find authentic merchandise autographed by Wally Moon. It's fun. It's easy. And, it's a great way to connect with one of your favorite players from baseball's Golden Era. Visit the Moon Shop. For the first time in more than a half century, there's a new baseball card commemorating Wally Moon's time with the St. Louis Cardinals. It's the Christian Family Day 2009 testimony card and the Moon Shop is the only place to buy the complete set, featuring the Wally card autographed by the former Rookie of the Year himself! Learn More. Collectors and fans, Wally Moon is available for private autograph signing sessions. You can meet one of your all-time favorite players and have him sign your custom merchandise and memorabilia. For more information on how to arrange a private signing with Wally, fill out the form on the Contact Wally page and we'll get back with you soon.